If you are an owner or just a fan of Pearson boats then you are in the right spot. We are a passionate, fun-loving group of boating enthusiasts and we welcome you to our clubhouse. 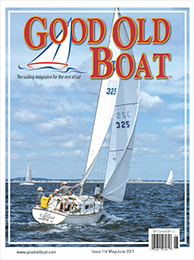 A bimonthly publication for sailors focusing on maintaining, upgrading, and owning cruising sailboats built since the late 1950s. The magazine is published in paper and digital forms, and, along with the website, provides loads of great resources for sailors. copyright ©2019 Ariel Associates. All rights reserved.